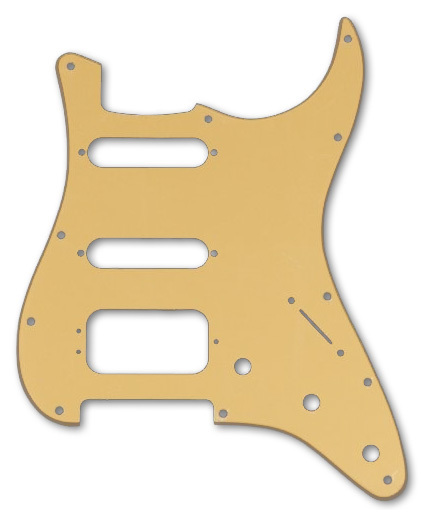 Genuine Fender® Stratocaster® 1 Ply Gold Metallic HSS Pickguard. 11 Hole Standard. One Humbucking pickup and two single coil pickups. The Humbucking pickup mounting holes are the standard Fender® 3 hole style. This pickguard is made out of vinyl or plastic, do not confuse the name Metallic for a metal or aluminum. We have discontinued stocking this pickguard, once our remaining inventory is sold we will not be repurchasing this pickguard from Fender.